MindGenius has been around for over a decade, helping business and project managers to achieve well organized and interactive levels of planning and problem-solving strategies. 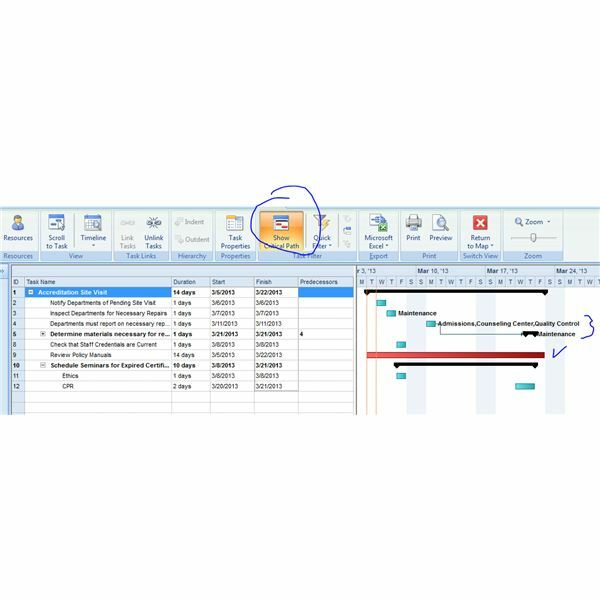 It’s a downloadable software for your Microsoft Office platform, and as the company promises with Version 4 of its product, it truly takes you on an information journey. Use it in planning sessions with your project team or clients in order to capture ideas and make decisions. Engage your team in a brainstorm, and then choose the path of action that captures consensus approval. Put your hands on the tools you need to fine-tune your plan. Create an easy platform for analyzing and categorizing data. The more you use this software, the more ways you'll find to use it. You're not going to buy this product and then have a lot of down time learning how it works. 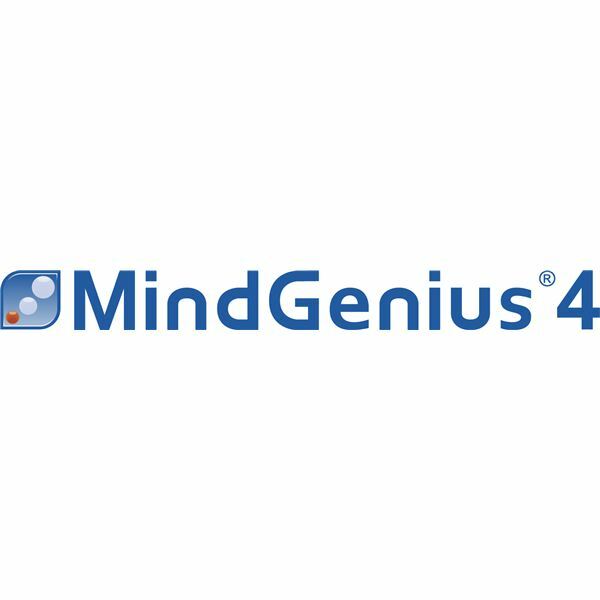 You can be using MindGenius within minutes of your purchase. It’s one of the most easily mastered, intuitive applications that this writer has come across, including both software downloads and cloud-based software as a service. If you can type and press Enter, if you can drag and drop, then you can operate MindGenius. 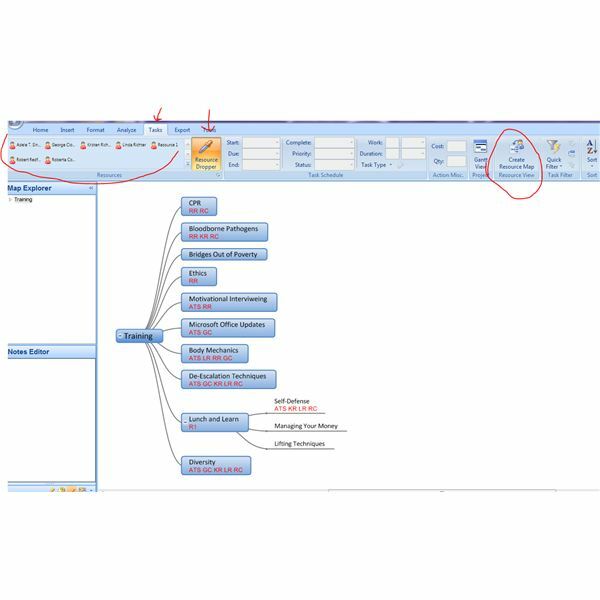 MindGenius lets you move right past product installation to get on with the many ideas brewing in the heads of your team members. Once you’ve gone past the quick download and opened it on your desktop, you'll find yourself at a screen that displays a basic map of options: Beginning with Welcome, you will see branches for Getting Started, Helpful Weblinks, and Get in Touch. Clicking on one of the Internet logos gives you an immediate look at a video or access to the user’s guide. 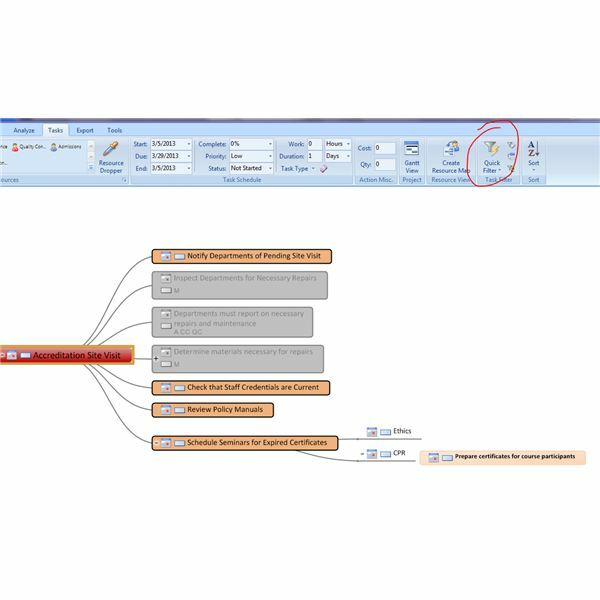 As you work with this software, you will create maps using blocks of text to explore your ideas. The maps can get really big, depending on the scope or duration of the project. 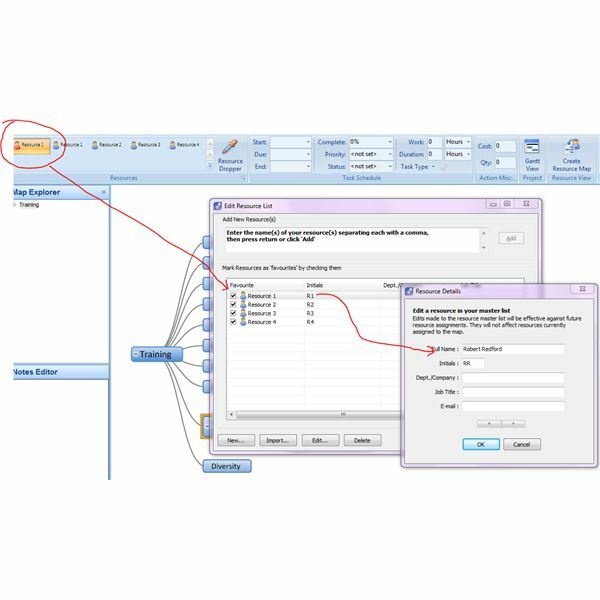 As you type in the phases or tasks you wish to accomplish, MindGenius indexes your key points in a window on the left-hand side of your screen. This is the Map Explorer, a key feature unique to this software. 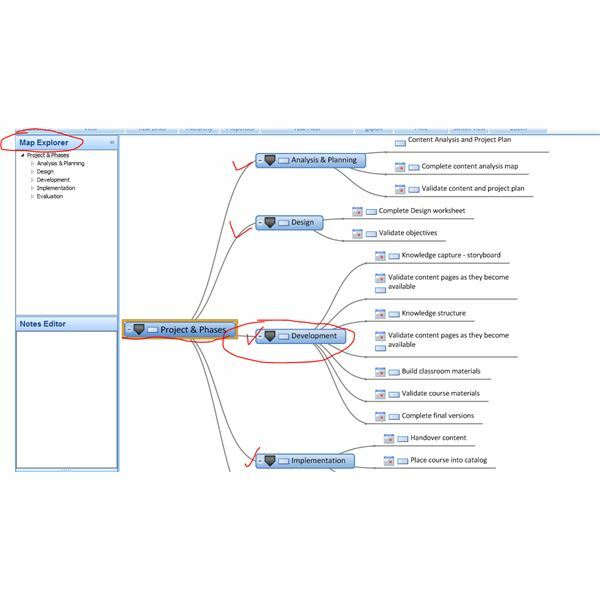 It allows you to take an overview of your entire project, or you can zero in on specific aspects just by clicking on an individual branch of your idea map. Because ideas come in families, MindGenius refers to the various levels of thought as parent, sibling, or child ideas. That very accessibility to your information is the basis of its versatility. 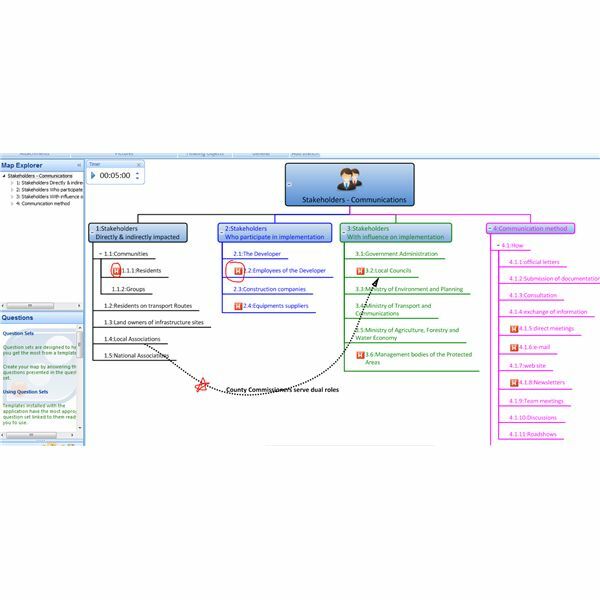 It’s easy to visualize your project phases and recognize realistic deliverables. It’s likewise an easy matter to format the look of your maps. Perhaps you’d like a bottom-up approach rather than the typical top-down view. Maybe you respond better visually to a more angulated diagram rather than the arching curves set of the default style. Go to the Home tab and click on the Map Layouts tab in order to view the opening screen in various layouts. Colors and graphics are among your choices. For a simple demonstration, I’ve created a map of the training sessions necessary for the staff at an imaginary social services agency. If you’re the training director, you must organize and schedule courses on CPR, Blood-borne Pathogens, Bridges Out of Poverty, Ethics, Motivational Interviewing, and other topics. You need only to type in the name of each training session and hit Enter, and then type in another—as quickly as your mind can work to list the trainings your staff require. 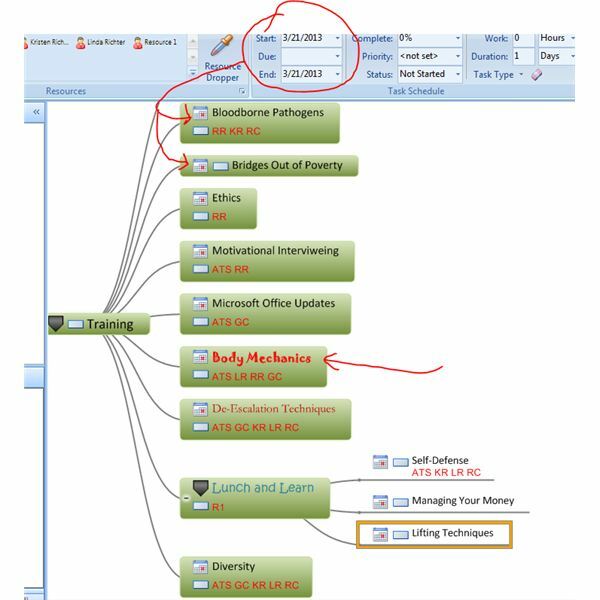 Next you go to the Task tab and view the Resources category for a list of the staff to be scheduled for the training. As you open MindGenius, they are simply named Resource1, Resource 2, etc. Arrow down below the resources and choose Manage Resources. You can then identify your resources by name, job title, email, and so forth. You can also check off which ones are your favorites—your go-to team, perhaps. Next, you click on the Resource Dropper and "drop" names on the training sessions to indicate which people will take each course. Their initials will appear on the blocks of your map. As you work, perhaps you’d like to view the list according to staff names and the courses they will take. To do this you simply click on Create Resource Map. You will then have a completely new map listing each member of your team as well as the courses they are taking. The original map exists behind it, unchanged. It's easy to assign dates to your tasks—in this case, the dates of the training sessions. It’s possible to indicate start date, due date, end date, percent complete, priority, status, and duration. Once you’ve finished a little calendar appears within the block. It’s also possible to change the formatting of the map; you can see that I’ve changed the color of the blocks, chosen different font styles, and even added subtasks. If you want angled lines instead of curved lines, it’s your choice. In this next view, I’ve taken my training project file to the next step and converted it into a Gantt chart. It not only shows the dates of the various classes I’ve scheduled for my staff, it also lists the names of attendees. 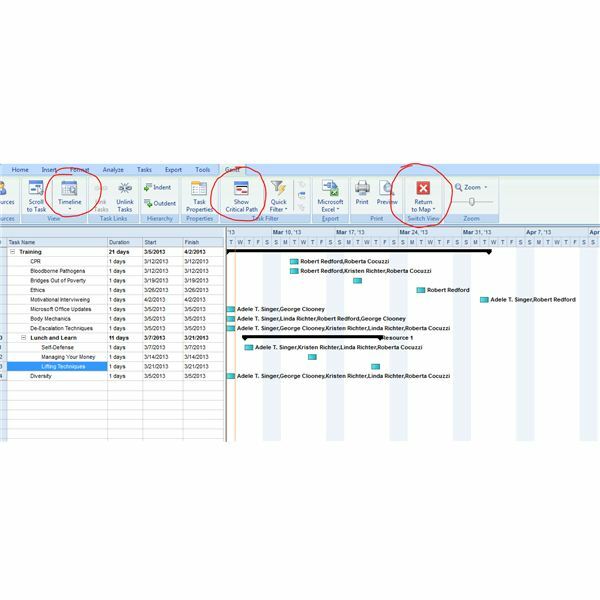 You can adjust the timeline of the Gantt chart to show hours, days, weeks, or months. You can link tasks to show dependencies, and then you can return to Map view. 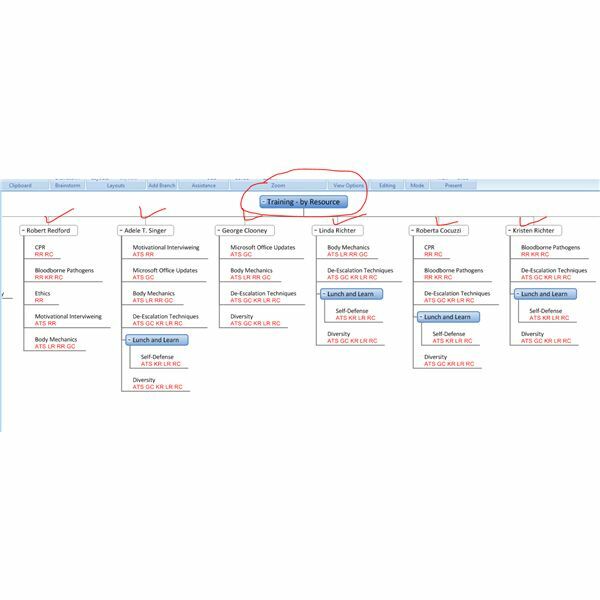 Any changes you make in Map view will show up on the Gantt chart—and vice versa. Let’s look at a different map showing the steps necessary to prepare for a site accreditation visit. To get this project rolling, I’ve typed in some (very!) basic initial steps. You drag and drop the blocks to put them in order or if you recognize that one task depends upon another. The gray pentagrams indicate that the tasks have subtasks. Dates are applied on the subtasks. To add resources on this project, I’ve chosen to identify departments instead of people, including Admitting, the Counseling Center, and Quality Control. Each department must report on policies that need to be updated and repairs that are necessary. 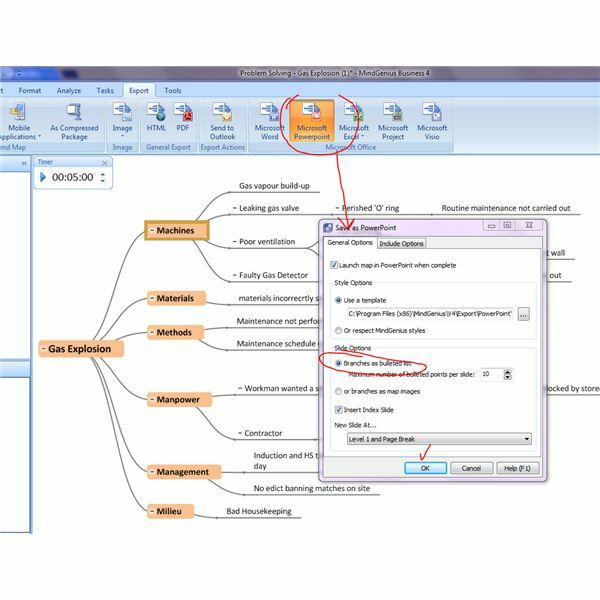 Resource Dropper to assign resources to tasks as applicable. You can also add resources by importing them from Outlook. Click on the arrow at the bottom of the Resource category to reveal your Edit Resource window. 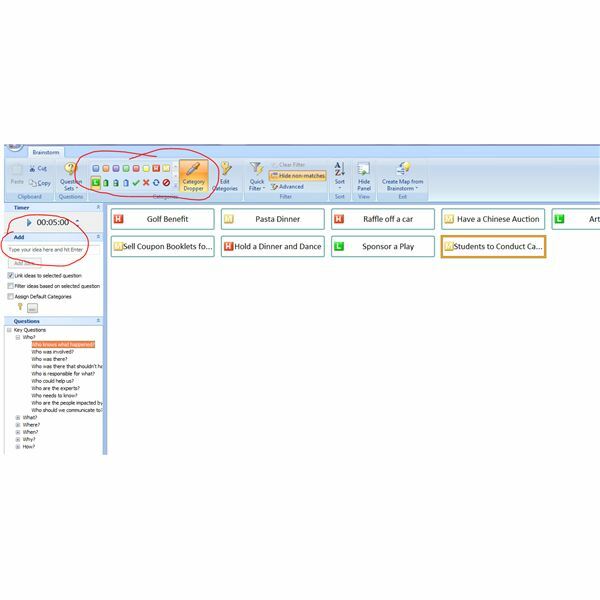 Click on Import and then choose your Outlook contacts. To the right is the Accreditation Project viewed as a Gantt chart. 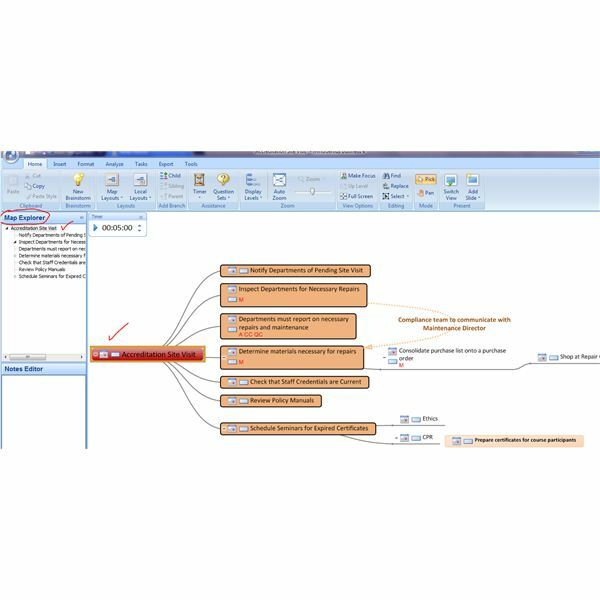 Although this is just a basic demonstration, you can see that the Gantt chart shows tasks and subtasks, assignments, dependencies and predecessors, and a critical path. The next map layout shows how you can branch ideas out from a central theme. This image shows Business Goals, with the attendant aspects of project management, finance, operations, development, marketing, and learning and development. If you click on just one of those aspects, it will display the map in the same thematic format. For example, look to the right, where we have focused solely on Development. MindGenius shows the key points of Development in the same map layout design as its parent idea. You can use the Filter to show your tasks according to those assigned to you or choose from other parameters such as Completed Date, Summary Tasks, and so forth. Anybody Up For a Brainstorm? fundraiser. Why not project it onto a wall so that everyone can see what you type in—and toss in their two cents? Many people collaborate on a list of ideas or goals and then take a photo of the whiteboard they’ve used to record their thoughts. With MindGenius, you simply click on Brainstorm. In the Add box you type in ideas as quickly as people contribute them. Once everybody’s thoughts are set down, use the Category Dropper to assign ideas with a priority of High, Medium, or Low. Assuming you’ve got many more ideas than the few I’ve entered here, it will benefit you to switch to a create a Category-Centric map like the one to the right. It's also useful to email your Map to people who participated in the session, or even to those who could not be present. It's an effective way to take ideas to the next level. Below there's a section on exporting and emailing your maps. The more you work with MindGenius, the more discoveries you’ll make about its possibilities. You can take a retrospective look at your project; if you work in an Agile environment, you’ll want to do this every two to four weeks. 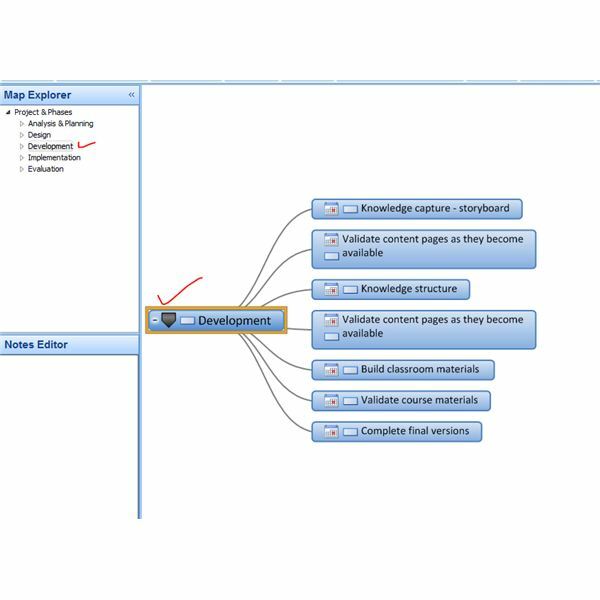 If your stakeholders need access to a document, you can upload it to the map. 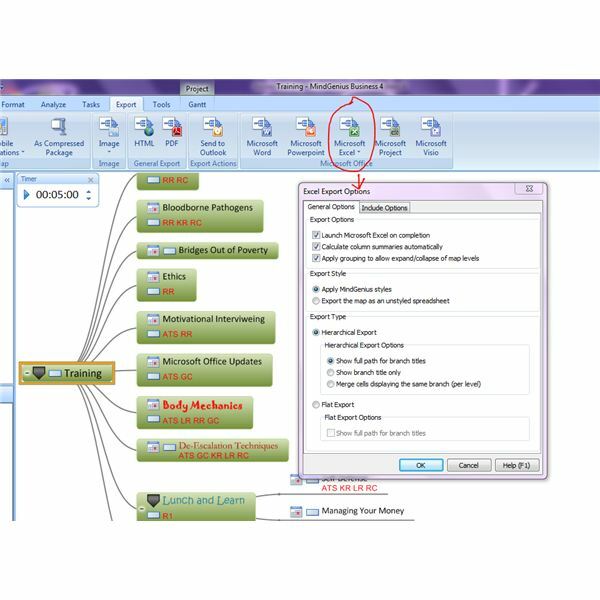 You can authorize other people to access and update your project maps. 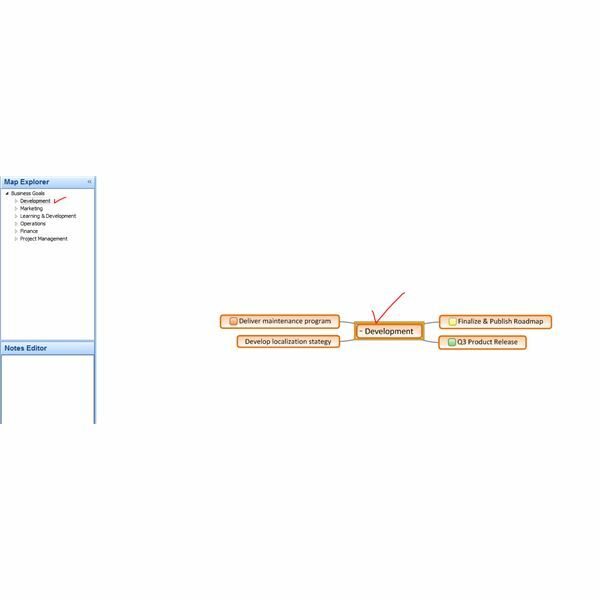 It’s easy to draw lines showing links between tasks—not the dependencies demonstrated in the project examples, but a way to notate connections between two or more tasks. In the image to the left, the map is color-coded according to category of stakeholder. There is a dotted line showing a connection between local associations and the local councils—with a typed notation that the county commissioners serve dual roles. I also inserted WBS formatting in this image to show how useful it would be in a project task list. This is accessed via the Format tab. You’ll also see that certain stakeholders or communication strategies have been flagged as high priority. 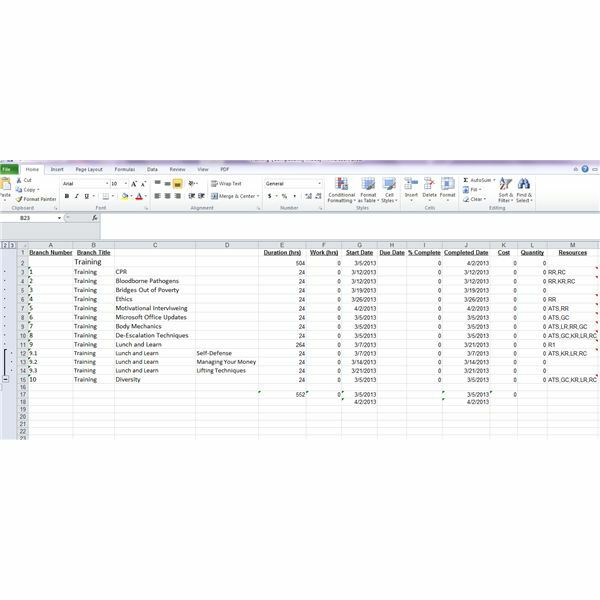 You can create reports by exporting your data to Microsoft Word, Excel, Project, or Visio. 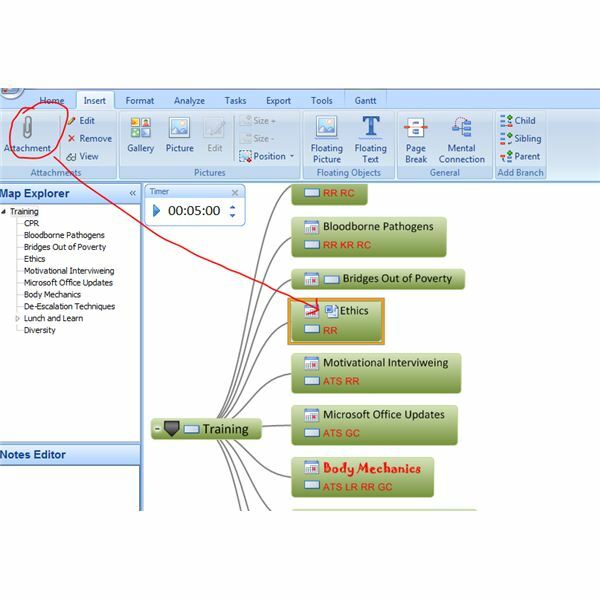 The image below shows the Training map exported to Excel. Another way to share your project is by exporting it in an email. On the Export tab, click on As Email Attachment With Preview, and MindGenius immediately creates an email with your project attached as a MindGenius file and also as an image. If your recipient doesn’t have MindGenius, he can nevertheless view your project file as an image. Imagine, too, if you’ve held a brainstorming session; you can capture the entire brainstorm and send it out as an image to other people in order to query their input. How about saving it as an Outlook presentation? 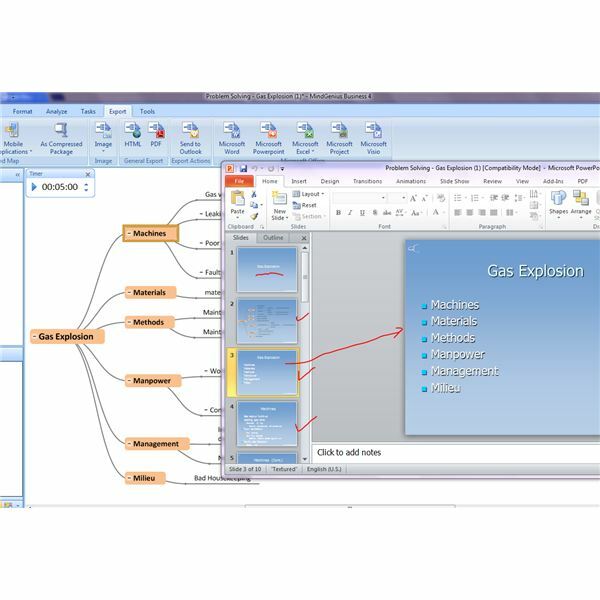 The images below show a presentation concerning the causes of a gas explosion. All I did was click on the Microsoft PowerPoint option and MindGenius did the rest. 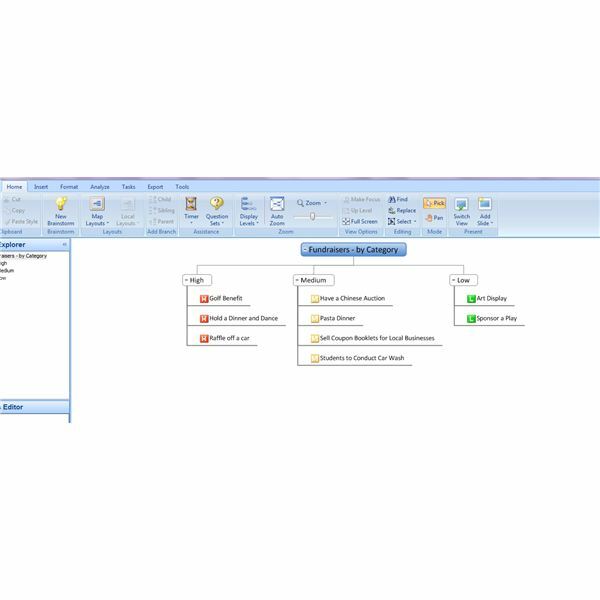 This product is notable for its truly facile transitions to or from other applications. This is a versatile, fluid software that will help you run your business and your projects with much greater efficiency. If you want to purchase a single-user license, you can do so for about $235. The option to have five users on the product will cost your company $1,115, and the ten-user license goes for $2,190. MindGenius offers half-price packages for charitable organizations and a discount if you’re a not-for-profit. Considering the wealth of benefits and the ease of use afforded by this product, the price is well worth it. If you’d like to take it for a test drive before you commit to a purchase, your thirty-day trial will be fully functional with the full force of MindGenius’s help options behind your successful use of this product. Most images were created entirely by the writer. Some screenshots were adapted from images made available by MindGenius.